Fairshare Farm is now accepting Member and Supporter applications! Read Our Terms and Conditions. This explains all the expectations of Members/Supporters and rules of the garden. These include agreeing to attending your garden night every week, communication expectations, and the rules gardeners must abide by when gardening. Both Members and Supporters must agree to abide by this document. If you would like to fill out our forms electronically, you can find these on Google Forms here: Membership Google Form and Supporter Google Form. If you cannot fill out the Google Forms, you can fill out the Member form or the Supporter form and mail it in to the address at the bottom of the form. Pay the fee. You can pay via our GiveMN Page (just put “Fairshare Farm” in the notes when you pay) or send check/cash to the address below. Checks should be made out to the Southeast Como Improvement Association. Members are required to pay a $20 fee which guarantees you produce on the weeks you attend. Supporters may pay whatever amount they wish but may not always receive produce on the weeks they attend if Member needs are high. Wait for an email from us! You’ll receive a confirmation that we received your filled out application and payment as well as a notification that you’ve been added to the Fairshare Farm Google Group for emails. If we run out of space, you’ll be notified that you’ll be put on a waitlist and your payment will be returned. 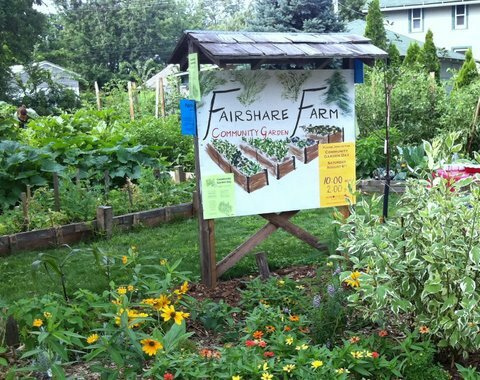 The FairShare Farm garden is a shared garden space without individual plots. The organic vegetables are grown communally and harvest is split with elders in the Como area and participating gardeners. FairShare Farm has an ongoing relationship with the Southeast Seniors and the Little Kitchen Food Shelf. It is a learning space, so all levels of gardeners are welcome. To facilitate gathering and learning, the FairShare members often host Skillshares and monthly events called Farm On! To support skillshares either through skillsharing informally during gardening, teaching a little of your own demo, arranging for other demonstrations to happen, or help host our community events. In order to keep up the level of participation, and attention to crops that is needed, we strongly encourage that gardeners live or work in SE Mpls. There is not a residency requirement, but close proximity is important in order to reduce barriers to participation and keep crops healthy. Most of our gardeners live around the University of Minnesota, in the Southeast Como neighborhood, or in nearby Northeast Minneapolis. The garden shed at FairShare Farm on the corner of 22nd and Fairmount SE has basic gardening tools that can be borrowed if you want to start a garden of your own or do other yard work but haven’t the tools to do so. In order to borrow shovels, rakes, forks, etc., come to the garden during one of our special or regular gardening times and sign them out. Our regular garden work sessions will start on Tuesday May 16, 2017 the regular sessions will be Tuesday and Thursday evenings and Sundays in the early afternoon. If you want to use the Weed Wrench, please contact kathy@secomo.org or call 612-623-3562. She will be coordinating use of the weed wrench this season so it is readily accessible to potential users.